Will the Republican Health-Care Debacle Pave the Way for ‘Medicare for All’? Only if progressives force the debate. This week, the Congressional Budget Office confirmed what was already apparent: The revised House Republican health-care bill will still deprive millions of Americans—23 million in the CBO estimate—of health insurance. Senate Republicans are devising their plan in secret, because it too will likely deprive millions of health coverage. During the campaign, Donald Trump pledged, “I am not going to cut Medicaid”; now Trumpcare and his budget would slash it by 45 percent. In contrast with Republican horrors, Obamacare has grown in popularity, but premiums are rising as insurance companies consolidate monopolies in various states and Trump works to sabotage it. Surely, now is the time for progressives to wage a fierce campaign for Medicare for All. Why Won’t More American Corporations Support Single-Payer Health Care? Americans are more than ready. A January poll by the Pew Research Center found that 60 percent of Americans surveyed agree that the government should be responsible for ensuring health care for all, with support at its highest levels in a decade. An April Economist/YouGov poll found 60 percent of Americans favored “expanding Medicare to provide health insurance for every American.” Support was consistent across lines of race, age, and income. Fifty-eight percent of self-identified independents and 60 percent of moderates were in favor. Forty-six percent of Republicans and 43 percent of self-described conservatives signed on as well. The popularity of expanding Medicare is surprising, given how little support it has received from the political class. In 2016, Bernie Sanders stumped for it, but Hillary Clinton dismissed it out of hand, arguing it “will never, ever come to pass.” Democratic leaders in the House and Senate want Democrats to defend Obamacare, not talk about Medicare for All. Even the Congressional Progressive Caucus, which has championed single-payer health care, decided not to include it in its 2017 budget. Churchill is erroneously quoted as saying that “Americans will always do the right thing, only after they have tried everything else.” On health care, we’ve pretty much exhausted “everything else.” ACA still leaves over 20 million without health insurance, and leaves Americans to the tender mercies of entrenched insurance and drug companies. The House Republican bill would leave 51 million Americans without health insurance by 2026. It “saves money” largely by depriving people of health insurance or leaving them with inadequate plans that don’t cover preexisting conditions. With Trump’s draconian budget, Republicans would put about half of the 70 million who receive Medicaid at risk, despite that fact that a vast majority of Americans and over 40 percent of Republican voters say that Medicaid expansion is important to them or their family. Republicans are likely to pay a big price politically in 2018 if they actually try to defend depriving millions of working and poor people of health insurance while using the savings to finance obscene tax cuts for the rich. Now, with the Republican debacle as backdrop, support for fundamental reform has picked up. Democratic state legislators in California are on the verge of passing a state single-payer plan, although Governor Brown remains skeptical. In January, Representative John Conyers (D-MI) reintroduced a single-payer bill that would create a publicly financed universal health-care system funded by a payroll-tax increase, tax hikes on the rich, and a financial-transactions tax. Conyers now has 104 cosponsors, with the backing of unions and progressive groups. Most politicians are still wary of defending “bureaucratic heath care,” or explaining the cost of “paying for it.” In fact, Medicare is far more efficient than private health insurance, and a single-payer system would capture massive savings from eliminating the administrative overhead and profit margins raked off by insurance and drug companies. Recipients would receive affordable comprehensive coverage at far less cost than under Obamacare. But the financing is vulnerable to attack, as Sanders discovered during the campaign. That is why it is vital for progressive political leaders and progressive grassroots groups to coalesce around a campaign for Medicare for all. Our Revolution, MoveOn, Democrats for America, Credo, Color of Change, People’s Action, the Progressive Congressional Campaign Committee, and others could turn the CNN prediction into reality and make support for Medicare for all a centerpiece of their candidate screening. Extensive public education efforts are needed to explain to people the advantages of the transition, even as the horrors of Republican reforms are revealed. Democrats should be pushed to go beyond merely a defense of Obamacare. They need to learn how to link exposure of Republican deforms with a call for moving to a more rational system. 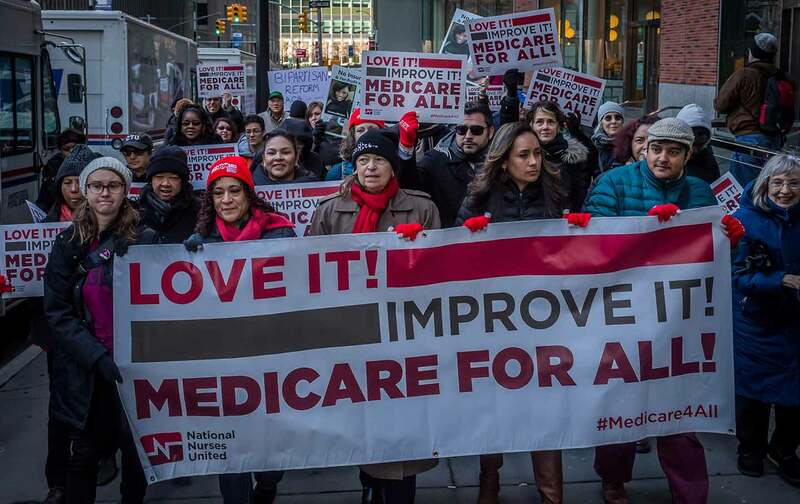 Those who support partial reforms—expansion of Medicaid, lowing the eligibility age of Medicare to 50 or 55, reviving the public option in the Obama exchanges—should be pushed to frame them as steps towards Medicare for all. None of this will be easy. The popular support offered up in a poll will be shaken by multimillion-dollar scare campaigns launched by insurance and drug companies. Those happy with their employer-based insurance will be wary. Seniors worried about diluting Medicare will be major targets. Legions of lobbyists—Democratic and Republican—will dine out on devising legislative, administrative, and judicial obstacles to fundamental reform. But as Sanders has shown, insurance and drug companies and their lobbyists are good enemies to take on. Will Republican efforts to repeal and replace Obamacare pave the way to Medicare for All? Only if progressives force the debate. Americans are looking for sensible reform. Medicare for All is the right answer. Now is the time for progressives to educate and enlist to take on the entrenched interests that stand in the way.